Vertical turbine pump does not require a water source that provides a positive suction pressure. As such, this type of pump is able to operate without priming. The typical supplies for these pumps are underground tanks or wells. 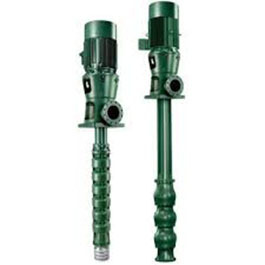 When operating, these pumps force water up through the column pipe to the pump discharge. The line shaft turbine pumps have above-ground discharge. Adds strength and rigidity to bowl to withstand installation and transportation stresses. Compensates for possible momentary upthrust occurring at start up. Produces optimum pressure versus capacity and allows for optional wear ring installation. Directs fluid flow to the bowl assembly with minimum turbulence while providing maximum motor support. Non-corrosive, restricts entry of foreign objects with size more than 6mm. They are water lubricated and spaced no more than 10 ft apart to ensure adequate centering of the line shaft within the column. They are permanently fixed in the bowl to eliminate any possibility of rotational and axial movement. Minimum use of floor space. The NPSH available can be the lowest level to satisfy the NPSH requirements of the pump. No priming required, the pump bowl assembly is submerged in the fluid being pumped. This type of pump is highly versatile and adaptable in terms of both location and pump length.